Home » Scrum Resources » How to Become a Scrum Master Certified Professional? How to Become a Scrum Master Certified Professional? “Scrum”, the latest buzzword that is taking the software industry by storm. Though Scrum is the recent project management methodology, many organizations particularly ITS and ITES organizations are taking to Scrum in a big way. With the increasing Agile implementation, Scrum is taking its turn too. Scrum is the powerful and popular Agile methodology which is simple, straightforward, and easy to implement. You can refer our previous article Agile Vs. ITIL to know difference between them. Scrum allows frequent, short iterations with continuous feedback also makes sure that the delivered end product aptly fits the customer needs. In addition, the flexibility of changing requirements in a controlled manner is possible with no extra cost and still, the project stays inline by evading the risk of destroying large chunks of previous works. Moreover, Scrum builds smart motivation by breaking down the whole work into small iterations with a number of smaller deadlines to meet. While there are a number of other iterative and incremental development methodologies out there in the software market, Scrum is on the simple side. And, we can very well say that the Scrum focuses on achieving positive reinforcement by removing obstacles rather than pointing fingers at others. Scrum encourages honest and open communication among teams with many other benefits, such as higher customer satisfaction, better product quality, increased productivity, reduced or stable project costs, and increased employee motivation and satisfaction. Hence, Scrum has flipped into a highly successful framework in the recent times. Scrum has three components and they are the product owner, Scrum team and Scrum master. A scrum master is the one who makes sure that the Scrum team stay inline with Scrum Values and practices. You can think of a basketball coach, he is the one who drives the team to play their best. Similarly, Scrum master is the process owner of the team who drives them to perform better as well as creating a balance with the project’s key stakeholder (the product owner). Scrum master helps the team to stay focused to meet the deadlines by eliminating the obstructions that might hinder the progress. With increased Agile practices being implemented in many organizations, Scrum Masters are in great demand. As the leader of a Scrum team, the Scrum master takes ownership of a project, provides all necessary guidance to the team as well as the product owner, and ensures all Scrum practices are correctly followed by Scrum team members. Any professionals interested in Agile and Scrum practices can become a Scrum master by taking up a 2-Day training program on the CSM course from a certified Scrum trainer. After completing the training program, candidates need to take up a multi-choice online examination. This certification exam consists of 50 questions to be answered in 1 hour time. To pass the final examination and become a certified Scrum Master, you must answer at least 60 percent of the questions correctly. But that is not going to bother you at all as the success rate is 98%. 1) Enroll yourself in a CSM training program with an authorized training provider. 2) Once you complete your training, take some breathing time to learn and master the concepts. 3) In 30 to 90 days, register for the CSM examination. 4) Take up the online test and look for your scores immediately when you complete the exam. 5) Get your SCM certificate instantly in PDF format. 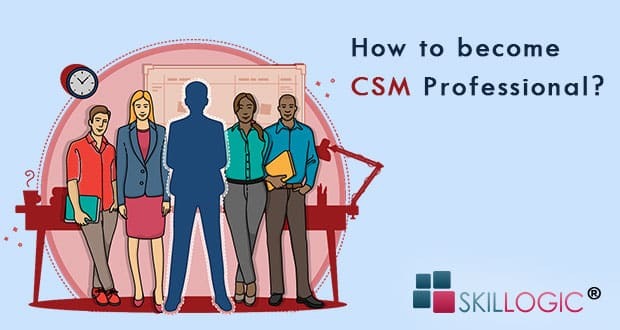 Candidates looking to become a certified CSM professional might get into a dilemma while choosing a training provider for completing this certification program. 2) Cost of the course. 3) Scheduling and the location. 4) The number of previous candidates who have passed. Why SKILLOGIC® for Scrum Certification Training? SKILLOGIC®’s offers best in class training programs in various industry related courses. This 2-days rigorous Scrum Master training helps the candidate to gain better knowledge on core concepts of Scrum methodologies along with practical knowledge to efficiently manage agile projects and enjoy successful results. The training program is aligned as per the Scrum Alliance CSM syllabus with practical knowledge to clear the certifying exam easily. The cost of training program covers, the 2-day course, unlimited online access to resources, CST online simulation mock tests and the final certifying exam that will be conducted at the end of 2nd-day training. SKILLOGIC® CSM training program is happening in all major cities in India including Bangalore, Chennai, Mumbai, Pune, Hyderabad, Delhi etc. The entire course is as per scrumalliance.org syllabus conducted by scrumalliance.org certified training (CST). We always restrict our batch size to around 15-20 members in order to facilitate healthy discussion between trainer and participants. Being conducted by certified scrum trainer (CST) by ScrumAlliance, our training program have helped many aspiring candidates to not only pass the certifying exam easily but also to get their foot right on the Scrum career. Previous: Agile and ITIL: Can they co-exist?